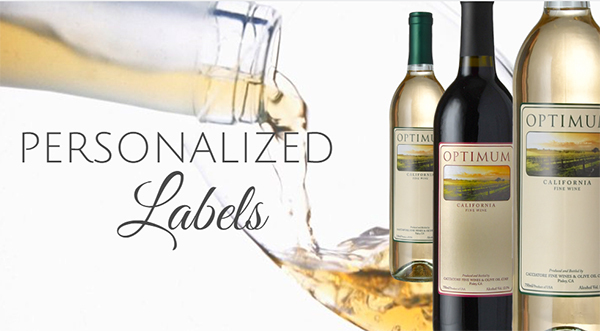 Optimum Personalized Label – Cacciatore Fine Wines & Olive Oil Corp.
“Optimum” labels are our specialty and our goal is to make your wine exclusive with your personalized message or logo. Great for Weddings, Events, Corporate and Personal Gifts. No matter what the occasion, make it special. There is no fee for the personalization. Once your order is received, a sample label will be emailed to you for approval. At that time, you may make any changes or approve the label. You can view sample labels here. Sold by the case of 12 bottles. All of the varieties listed below are available for personalization. Bouquet of red/black berries, tree fruit (cherry) and raisin. A hint of black pepper with notes of dark chocolate enhances the complexity of this wine. Bouquet of ripe fruit (stone fruit) as cherry, ripe peach and plum; notes of chocolate. The long finish, mellow tannins and lasting fruitiness make this wine enjoyable. Bouquet of cherry, raspberry, strawberry and pleasant, mild earthy forest-floor aromas. The ripe and generous tannis deliver a smooth wine with a long-lasting, pleasant aftertaste. Bouquet of primarily ripe tree fruit such as plum, peach and figs. With notes of spiciness and caramel complete it. Bouquet of dark cherries, plum and dry apricot in the background with clear notes of black pepper and chocolate. Bouquet of tropical (pineapple, banana) and tree fruit (peach), with notes of white flowers The taste recalls the bouquet. Bouquet of floral (orange blossom), tree fruit (peach pear) and melon. Taste is crisp but smooth with hints of pear and honeysuckle: rich feel lingers in the mouth. Phone or email your request and a sample label will be sent to you. If a logo or clip art is requested, please include in the email. If you would like some assistance call us at 1-559-757-9463 and one of our team will be happy to assist you!